Last winter, Mt. 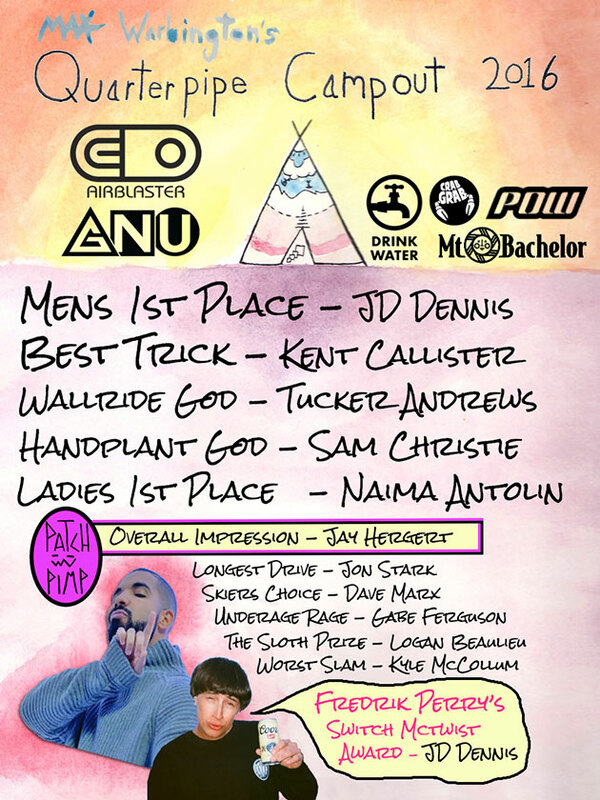 Bachelor in eastern Oregon was the place to close out the winter when Bend local, Think Thank and HCSC and Airblaster purveyor of stoke and good turns, Max Warbington collaborated with the mountain to host a one-of-a-kind spring quarterpipe and camping extravaganza. The appropriately titled, Max Warbington’s Quarterpipe Camp Out was an opportunity for PNW locals and visitors alike to convene on the trails of one of the hallowed mountains of the lower 48 to session the spring’s finest transition one last time before the snow melted. Max Warbington invited a slew of riders, including but definitely not limited to Max Tokunaga, Erik Leon, Gabe Ferguson, Sam Christie, Tucker Andrews, Kyle McCollum, JD Dennis, Jay Hergert, Kent Callister, Dave Marx, Juanitas, Conner Turney, and Dru Brownrigg and the crew beat out the weather, getting in a full day of boarding before Mother Nature turned on the faucet. Despite the rain, the QP Camp Out’ers enjoyed the night under the stars and clouds at the newest addition to the calendar of events that provide ample reason to enjoy what we all love best about snowboarding: riding with our friends. Enjoy the video recap of the event, filmed by Tyler Orton and click over to the full story of Max Warbington’s First Annual Quarterpipe Camp Out at Mt. Bachelor. Big thanks to Mt. Bachelor, Airblaster, and Gnu for all their help in making this event happen.